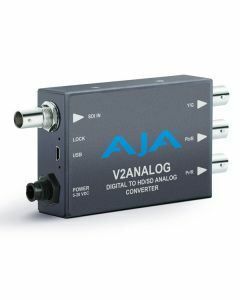 V2Analog performs high-quality SDI digital to component or composite analog conversion at either SD or HD resolutions using AJA’s industry-leading conversion technology to ensure the highest quality images for the most demanding situations. V2Analog is a high-quality, cost-effective digital to analog video converter that’s an ideal solution for integrating analog equipment such as monitors and tape decks into digital workflows. V2Analog performs high-quality SDI digital to component or composite analog conversion at either SD or HD resolutions with a full 10-bit data path. V2Analog takes incoming SDI signals and converts to YPbPr (SMPTE, EBU-N10), Betacam, or RGB component outputs or NTSC/PAL or Y/C (S-Video) composite outputs for complete integration into any workflow. Configuration can be set by on unit DIP switches or remotely via AJA MiniConfig software control over USB. V2Analog takes incoming SDI signals and converts to YPbPr (SMPTE, EBU-N10), Betacam, or RGB component outputs or NTSC/PAL or Y/C (S-Video) composite outputs for complete integration into any workflow. Utilizing a full 10-bit data path and AJA's high-quality digital-to-analog technology, V2Analog maintains the most detail possible to ensure a quality conversion at an extraordinary price.